A transverse process is a bony protrusion which is located at the back of a vertebrae bone in the spine. There is one on both sides of every vertebra in the cervical, thoracic as well as lumbar spine. The transverse processes are small and perforated by foramen transversarium in cervical vertebrae. Anterior and posterior roots are found in each process that terminates in tubercles known as anterior and posterior tubercles. The posterior root represents the transverse element of the developing vertebra. The two transverse processes are located on each side of the vertebral body and protrude from each side at the point where the lamina joins with the pedicle, among the superior and inferior articular processes. They also attach with muscles and ligaments, specifically with the intertransverse ligaments. A facet on both of the transverse processes of thoracic vertebrae joins with the tubercle of the rib. A facet on each side of the thoracic vertebral body joins with the head of the rib. On each side of the vertebra, there are superior and inferior articular facet joints which restrict the span of movement. A thin part of the vertebral arch referred to as the pars interarticularis connects these facets. 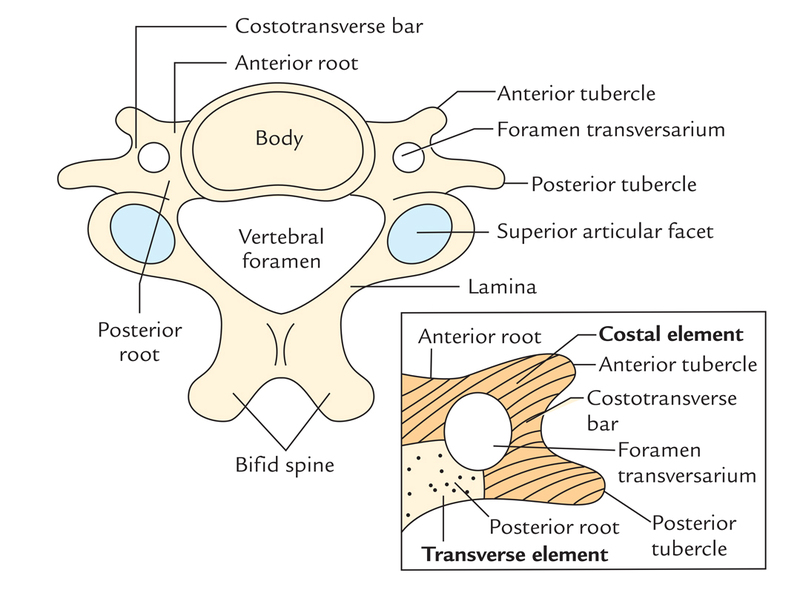 Transverse process of a lumbar vertebra is also known as the costal or costiform process as it resembles a basic rib or costa which, compared to the thorax, is not created in the lumbar region. Anteriorly, the prevertebral fascia connects with the anterior surfaces of the transverse processes as well as bodies of vertebrae CI to CVII. The third fascial space is inside the prevertebral layer enclosing the anterior surface of the transverse processes along with bodies of the cervical vertebrae. In order to generate a fascial space which originates at the base of the skull and spreads out through the posterior mediastinum towards the diaphragm, this layer divides within two laminae. Levator Scapulae muscle arises via transverse process of vertebrae CI to CIV. Posterior scalene muscle arises via posterior tubercles of transverse processes of vertebrae CIV to CVI. Middle scalene muscle arises via transverse processes of vertebrae CII to CVII. Anterior scalene muscle arises via anterior tubercles of the transverse processes of vertebrae CIII to CVI. Rectus capitis anterior emerges via anterior surface of lateral portion of atlas as well as its transverse process. Rectus capitis lateralis arises via superior surface of transverse process of atlas. Longus colli (superior oblique part) originates from anterior tubercles of transverse processes of vertebrae CIII to CV. Longus colli (Inferior oblique part) originates from anterior surface of bodies of vertebrae TI, TII, and maybe TIII. Longus colli (Vertical part) originates from anterior surface of bodies of TI to TIII and CV to CVII. Vertebral artery is the first division of the subclavian artery and rises up and goes inside the foramen within the transverse process of vertebra CVI. Inferior cervical ganglion is located anterior towards the neck of rib I as well as the transverse process of cervical vertebra CVII, along with posterior towards the first portion of the subclavian artery and the beginning of the vertebral artery. Accessory Nerve crosses in front of the transverse process of the atlas under the posterior belly of the digastric muscle and occipital artery. The seven cervical vertebrae are distinguished by their small size as well as via the existence of a foramen within each transverse process. Each transverse process functions as point of connection for spinal ligaments as well as spinal muscles that travel up and down the arranged vertebrae. 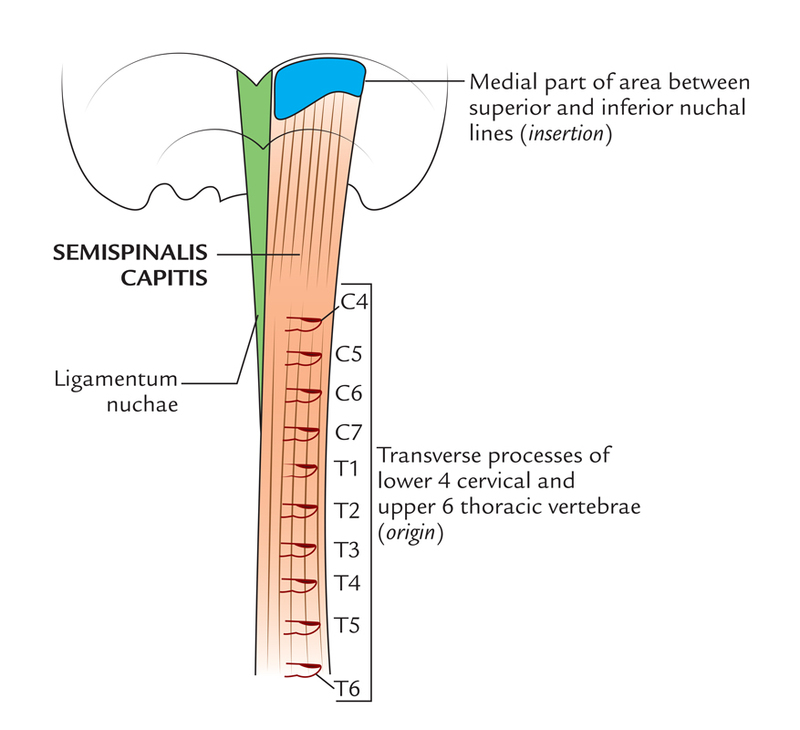 Also, the transverse processes help reinforce the framework of the spinal canal, which is a long space via which the spinal cord goes through the base of the skull till the lower back. A transverse process fracture is quite a rare injury. It usually results from a sudden extreme twisting or side bending motion. Occasionally it is a result of a direct impact towards the process; although they are covered by muscle. Avulsion fractures of the transverse process may also arise in the lumbar spine. The psoas muscle connects with the transverse processes and strong contraction of this muscle may create one or more fractures. As a result of the situation of the fracture it is unlikely to create any instability of the spine or any damage to the spinal cord.